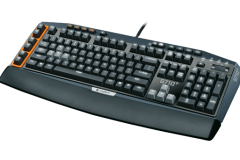 Logitech has been one of the most prominent desktop peripheral brands for years – here at pcgamers.net.au, we have a good representation of Logitech peripherals in our test lab and office. Over the past couple of years mechanical keyboards have been growing in popularity, especially among gamers, with the number of products entering the market growing steadily. 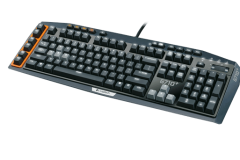 There has been much anticipation as to when Logitech would release it’s first mechanical keyboard in the gaming ‘G-series’ product line. 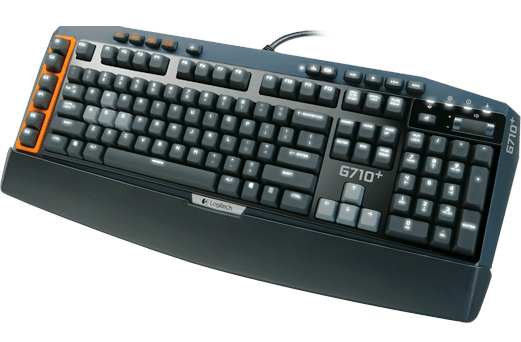 We were understandably keen to have the opportunity to test out the G710+ once it was announced so we’d like to thank Logitech for making one available to us. 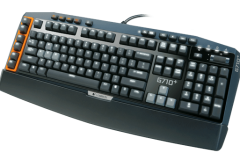 This latest entry into PC gaming peripherals is part of the Logitech G series refresh and we were eager to put the G710+ through its paces with both gaming and general document writing. Whilst Logitech might have been conscious of the desktop real estate, they obviously weren’t worried about the weight of this keyboard. 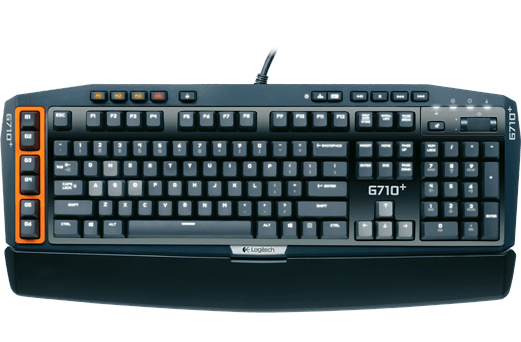 The G710+ is hefty, weighing in at 1.4kg. It feels solid and the keys are quite tactile (as expected), giving a rewarding click with each key-press. This is the point where I should mention that if you like a really silent keyboard, then mechanical keyboards in general are probably not going to be for you. That said, the G710+ isn’t the loudest mechanical keyboard on the market and the designers at Logitech have implemented o-rings to reduce the key press noise. 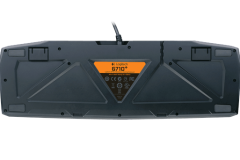 The G710+ sports an angular housing and each key has a 4mm key press distance requiring 45g of actuation force. 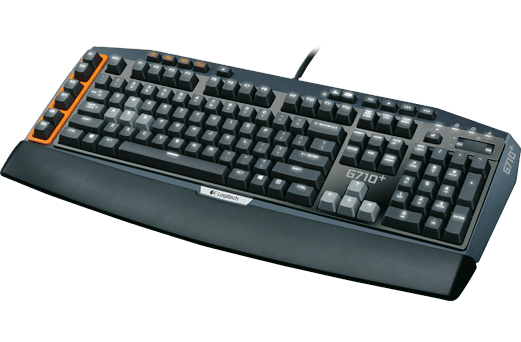 Logitech has implemented Cherry Brown switches and the tactile response feels well balanced. 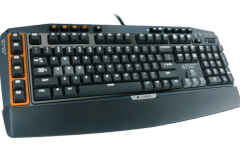 A mechanical keyboard uses mechanical switches, to record each key-press whilst other keyboards typically have a rubber domed switches under each key. Mechanical keyboards feel more crisp than keyboards with membrane or rubber domes switches. The trade off in achieving this ‘crispness’ is noise as the technology involves metal switches and plastic on plastic contact with each key press. 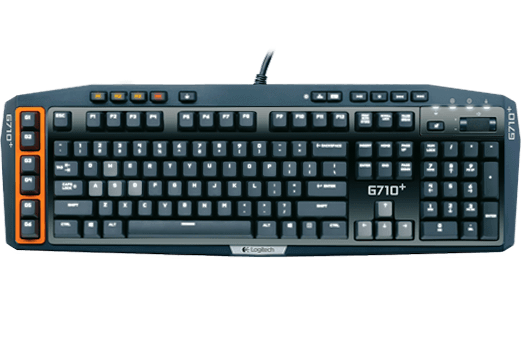 In order to address the noise element of mechanical switches, Logitech has designed the G710+ with ‘o’-rings under the keys to soften the impact when the keys “bottom out” if they are pressed hard or all the way down. By doing this, we can get the crisp tactile feedback that we want from a mechanical keyboard with a reduction in noise. 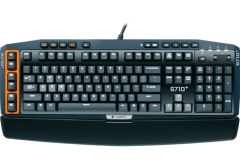 The G710+ is more than just a mechanical keyboard, it is a gaming keyboard and a new addition to the line of the G series peripherals. 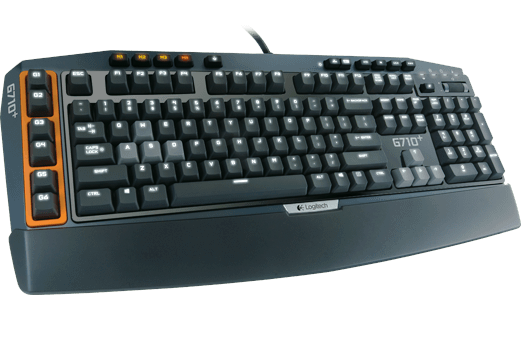 As with the previous gaming keyboards, Logitech has retained many of the elements that made the former G15, G110, G510 and G19 keyboards successful. 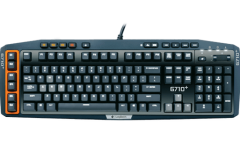 The G710+ features macro and media keys, a USB pass through port, variable back-lighting, gaming/desktop mode switching, a bold appearance and removable palm rest. 6 programmable macro buttons with 3 modes available making it 18 programmable options. individually back lit keys with variable intensity and zones. The back-light is great and one of our favorite features. The original G15 version 1 was huge and it had 18 gaming ‘G’ macro keys on the left hand side. 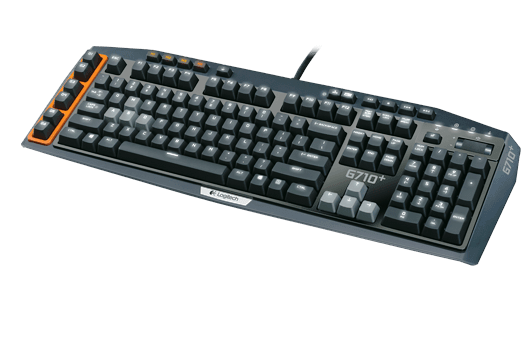 The G110 and G150 evolved from the G15 and came with different back-lighting and ‘only’ 12 ‘G’ keys. 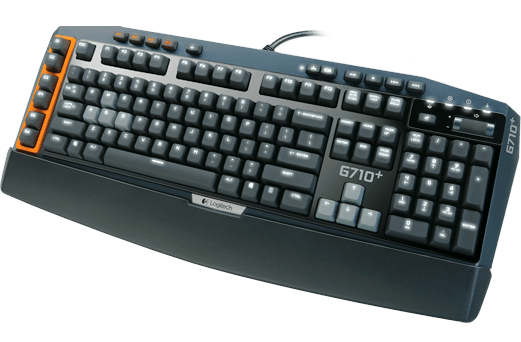 The G710+ further reduces the number of Macro keys to 6. This seems to be a good balance between a sensible desktop footprint and macro functionality. As it was, I struggled to find a use for more than 6 macro keys on the G110 and G150 keyboards. I have found this feature useful since the first G15 keyboard and it’s great to see it in the familiar place but this time around it’s actually a push button instead of a slider – and there is an indicator light above the number pad, on the right hand side to show if it’s active. This feels like a better implementation of the function than previous G series keyboards – very slick. 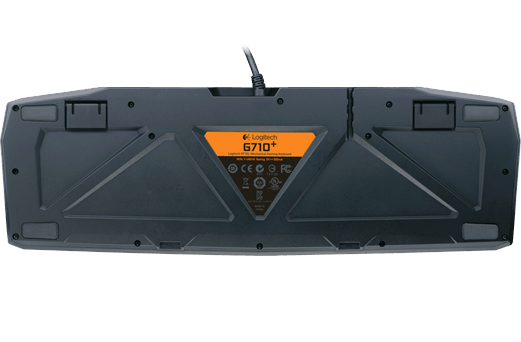 The G710+ has a thicker than usual cable and dual USB header. The USB cable to the PC is less likely to be snagged or tangled because of its thickness. The USB headers on the G710+ are bright orange so when you are looking behind your PC trying to remember what’s plugged in where, there is no doubt which cords belong to the keyboard. The port was more than capable of powering our USB memory keys, Corsair M60 gaming mouse or a USB headset which is more typical of how it would be used in our day to day activities. Like the G110 and G150, it won’t power a USB hard drive such as the WD Passport drive. The palm rest is probably the only thing that seems less than bulletproof. I found it to be very comfortable to use, aesthetically pleasing and, like the older G110, still has a cutout for cable pass underneath. If you had a USB headset, you would be able to plug it into the rear of the keyboard and route the cable under the G710+ and palm rest so that it doesn’t drape over the keys. There are also tilt legs at the back – this is pretty standard and it’s rare to encounter a keyboard without them.